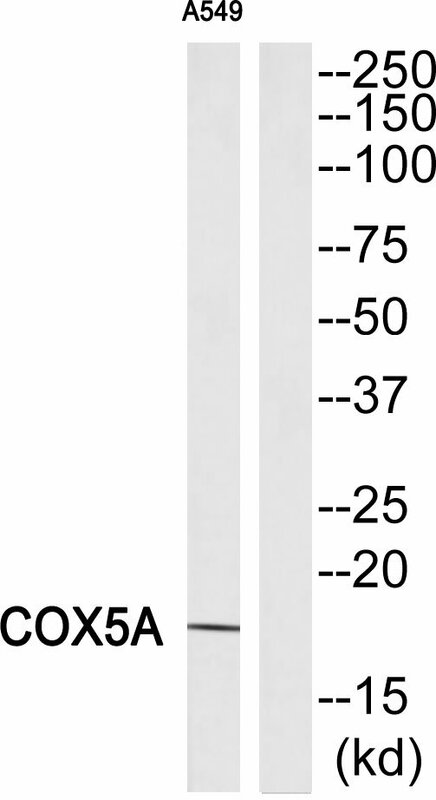 COX5A antibody detects endogenous levels of total COX5Aprotein. The antiserum was produced against synthesized peptide derived from Internal of human COX5A. Western blot analysis of extracts from A549 cells, using COX5A antibody. Rizzuto R., Gene 69:245-256(1988). Uddin M., BMC Evol. Biol. 8:8-8(2008). Ebert L., Submitted (MAY-2004) to the EMBL/GenBank/DDBJ databases. 1. The monomeric COX1 assembly intermediate accumulates demonstrating a function of COX5A in complex IV biogenesis. A potential therapeutic lead is demonstrated by showing that copper supplementation leads to partial rescue of complex IV deficiency in patient fibroblasts.